May 24 (1 to 5 p.m.) At Carlton Hill, taste more than 15 different wines from host Carlton Hill as well as Andrew Rich, Z’IVO and Copper Belt. Open only twice a year to the public. Food catered by Alcyone. Fee: $20 (includes glass). ||| May 23–25 (11 a.m. to 4 p.m.) The Carlton Winemakers Studio is home to 14 individual vintners that produce some of the regions most coveted wines under one innovative roof. Come visit us in historic Carlton, meet the vintners and sample current releases from our artisanal producers. Fee: $15. May 23 (noon to 5 p.m.) Live music and Ribslayer barbecue on the lawn. Kick off your shoes and dance to the music of Slipshod while you sip new releases from Carlton Cellars alongside resident winemakers Angel Vine, D’Anu and Libra. Fee: $10. May 23–24 (10 a.m. to 4 p.m.) We host breathtaking views of our vineyards and the Pacific Coast Range. Visit us for a mixed flight of red and white wines including new releases! Fee: $15. May 23–25 (11 a.m. to 4 p.m.) The Carlton Winemakers Studio is home to 14 vintners who produce some of the regions most coveted wines under one innovative roof. Come visit us in historic Carlton, meet the vintners and sample current releases from our artisanal producers. Fee: $15. May 23–24 (noon to 5 pm.) Join us for the release of our 2013 reds. Included in the mix of Italian varietals is our first Dolcetto from Crawford Vineyards. May 23–24 (10 a.m. to 4 p.m.) May 17 (noon to 4 p.m.) Come join us on the “beautiful slope” for the release of our 2012 Estate Reserve Pinot Noir and some great whites for the summer, along with a few “winery only” specials. We are only open twice a year, so don’t miss this chance to discover (or re-discover) us. Fee: $10. May 23–24 (11 a.m. to 4 p.m.) Explore our history of crafting a variety of unique Northwest wines to pair with seasonally-inspired cuisine, warm hospitality and spectacular views of the Coastal range. Fee includes antipasti tables. Open Monday. Fee: $15. May 23–25 (noon to 5 p.m.) Release of newly bottled wines, including 2013 Estate Tempranillo, 2013 Estate Reserve Pinot Noir, 2014 Albariño, 2014 Estate Rose, plus a barrel tasting of 2014 vintage. Appetizers will be served. Fee: $5–$10. May 24 (1 to 5 p.m.) Featuring more than 15 wines for tasting. In addition to Carlton Hill Pinot Noirs, the latest wines from Andrew Rich, Z’IVO and Copper Belt will be poured as well. Open only twice a year. Food by Alcyone. Fee: $20 (includes glass). May 23–25 (11 a.m. to 4 p.m.) The Carlton Winemakers Studio is home to 14 vintners who produce some of the regions most coveted wines under one innovative roof. Meet the vintners and sample current releases from our artisanal producers. Fee: $15. May 24 (1 to 5 p.m.) This event will feature over 15 different wines for tasting. In addition to Carlton Hill Pinot Noirs, the latest wines from Andrew Rich, Z’IVO and Copper Belt will sampled as well. Open only twice a year to the public. Food catered by Alcyone. Fee: $20 (includes glass). May 25 (11:30 a.m. and 2:30 p.m.) Join us for one of two seatings with a seated tasting with our winemaker, Isabelle Dutartre. Enjoy a comparative tasting of our Melon de Bourgogne, a side-by-side of our two vineyards and more. Learn about our wines from the person behind them. Fee: $20. May 23–25 (noon to 5 p.m.) Wines available for tasting: 2013 Pinot Noir Rosé, 2012 Pinot Noir Blanc, 2011 Bayliss-Bower Pinot Noir and 2011 Prospector’s Reserve. Fee: $5. May 23–25 (11 a.m. to 6 p.m.) Join K & M (Ken and Mauro) in Carlton. Featuring estate-grown Chardonnay and Pinot Noir and new releases of rosé of Pinot Noir, Syrah and Cabernet Franc. Live music Saturday afternoon with Corral Creek Bluegrass and food pairings, too. Fee: $10. May 23–24 (11 a.m. to 5 p.m.) Join us Saturday and Sunday for a wine tasting at the tasting room. Closed Monday. May 23 (11 a.m. to 4 p.m.) Join us under the Enterprise and taste a wide selection of 2012 and 2013 Pinot Noirs and white wines. Tasting room will be open Sunday and Monday. Fee: $20. May 23–24 (noon to 4 p.m.) Taste our award-winning Pinot Noir and Cabernet Sauvignon and enjoy a delicious lunch at The Horse Radish. No fee. May 23–24 (noon to 4 p.m.) Omero Cellars welcomes you to come visit our new winery and taste and our newest releases with our winemaker. Fee: $10. May 23–24 (noon to 5 p.m.) Featuring newly released Wildstock Chardonnay, Pinot Blanc and Pinot Noir, and limited-production Scott Paul Pinot Noirs, including our highly regarded Audrey Pinot Noir (named after the beautiful and elegant Audrey Hepurn). Fee: $10. May 23–25 (11 a.m. to 5 p.m.) Join our winemaker as he pours our small-production wines made using traditional, Old World winemaking methods. Luminous Hills is Estate Grown Pinot Noir. Seven of Hearts is about exploring other vineyards, appellations and varietals: Chardonnay, Riesling Pinot Gris, Sauvignon Blanc, Viognier, Roussanne, Rosé, Pinot Noir, Grenache, Syrah, Mourvèdre, Cabernet Franc, Merlot, Cabernet Sauvignon, Tannat, blends and dessert wines. Custom wine-tasting chocolates by Honest Chocolates and charcuterie by The Beautiful Pig. Fee: $10. May 23–24 (noon to 4 p.m.) Please join us to taste our newly released wines. You’ll have the chance to chat with our staff and winemakers, and meet our new culinary director, Jonathan Lindenauer. Enjoy delicious hors d’oeuvres crafted by Chef Jon while taking in fabulous valley views. Fee: $25. May 22–23 (11 a.m. to 6 p.m.); May 24 (11 a.m. to 5 p.m.) Offering three Pinot Noirs, three Merlots, one Syrah, and small bites of artisan cheeses and bread. Fee: $10. May 23–25 (11 a.m. to 5 p.m.) After some extended bottle aging, we’re excited to unveil our 2011 Pinot Noirs along with a first for us: a late-harvest (sweet) white wine from 2013. We’ll also be sampling our high-scoring 2012 Pinots. Come visit us in downtown Carlton. Fee: $10. May 23–25 (11 a.m. to 4 p.m.) The Carlton Winemakers Studio is home to 14 individual vintners that produce some of the regions most coveted wines under one innovative roof. Come visit us in historic Carlton, meet the vintners and sample current releases from our artisanal producers. Fee: $15. Find event listing in Newberg, too. May 24 (noon to 5 p.m.) Please join us and our friends for new releases and great food. Fee: $20. May 16–17 (noon to 3 p.m.) We will be open for a few hours on Saturday and Sunday for tastings. New releases and library wines. Fee: $15. May 23–24 (11 a.m. to 4 p.m.) Please join us at our shared Brittan and Winderlea tasting room in McMinnville’s Granary District. We will be pouring a flight of five Brittan and Winderlea wines, plus a special reserve flight of 2012 Winderlea Legacy and 2012 Brittan Gestalt Block. Fee: $10–$15. May 23–25 (11 a.m. to 4 p.m.) Saturday only, Sky Bound Blue is at CdT pairing their local sound with Scott and Lisa Neal’s newest wine releases. Join us through the weekend for Riesling, Gris, Rosé, Estate Syrah, and our latest 2012 Reserve Pinots Noirs. Tasty bites and beautiful views included. Fee: $20. May 23–25 (noon to 5 p.m.) Join us for our 17th vintage of estate wines, along with wines made from grapes we source around the Pacific Northwest. We welcome you. Food pairings provided. Fee: $10 (includes glass). May 23–24 (11 a.m. to 5 p.m.) Join us this Memorial Weekend for a wine tasting at JL Kiff Ranch. Fee: $10. May 23 (noon to 5 p.m.) Come hang and taste with us during our Party for the People. Celebrate the combination of people, food and, of course, wine that makes this land great. Try wines from our portfolio from Willamette Valley, Columbia Gorge and Rogue Valley. Good times and good vibes. Fee: $15. May 22–25 (noon to 6 p.m.) Taste a 92-point signature-style Pinot Noir, our single-vineyard collection, excellent Pinot Gris, plus special guest varietals from our southern sister winery, including Tempranillo and Cab Franc. Enjoy light bites, live music on Saturday (3 to 6 p.m.) from Naomi LaViolette. Taste through your favorite flight, tour the winery or relax on the patio with a glass. Fee: $10. May 23–26 (noon to 5 p.m.) Join us to celebrate the beginning of summer and the end of another great season. Sample our exciting spring releases and library selections paired with house-selected cheeses and breads. Fee: $20. May 23–25 (1 to 6 p.m.) Come taste some of the best the Willamette Valley has to offer. Pinot Gris, Gewürztraminer, rosé, Pinot Noir, Müller-Thurgau and our brand new 2014 Sauvignon Blanc. 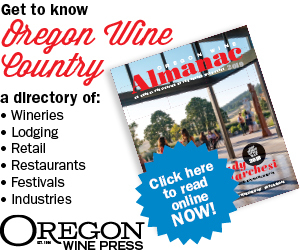 We look forward to seeing you at the farm in Philomath or our tasting room in McMinnville. Fee: $10. May 23–25 (11 a.m. to 5 p.m.) Nestled in the foothills of McMinnville, our Biodynamic vineyard captures unique characteristics from some of the oldest soils in the state. Join us as we pour our Pinot Blanc, Pinot Gris and premium Pinot Noir wines paired with our favorite dishes. Fee: $20. May 22–23 (noon to 8 p.m.); May 24 (noon to 6 p.m.) Join us in our Wine Bar in charming downtown McMinnville to taste our many Pinot Noirs. We also make two sparkling wines and two Port-style wines, all of which have devoted cult followers, not to mention our enticing menu of small plates that pair perfectly with our wines. Fee: $12–$15. May 23 (11 a.m. to 4 p.m.) “Winemaker Saturday” at Walnut City WineWorks featuring hand-crafted Pinot Noir, Syrah and an array of boutique white wines, paired with delectable bites and local art. “Producing great wines from the ground up.” Tasting room open regular hours Friday and Sunday, 11 a.m. to 4:30 p.m. Fee: $12. May 23–25 (11 a.m. to 5 p.m.) Winemakers Amy Wesselman and David Autrey look forward to personally welcoming you at Westrey to taste, chat and enjoy an assortment of cheeses. Westrey is open only twice a year, so don’t miss this chance to explore McMinnville and taste new releases. Fee: $10. May 22–23 (11 a.m. to 8 pm. ); May 24–25 (11 a.m. to 6 p.m.) We’ll have special wine flights in addition to our award-winning Pinots. Club members will be able to sample our exclusive single-AVA wines from the outstanding 2012 vintage. Lonestar BBQ & Catering will be here, and we’ll have live music Friday evening and Saturday afternoon. No fee. May 23–25 (11 a.m. to 5 p.m.) Join us for food pairings with each of our wines. Fee: $10. May 23–25 (10 a.m. to 4 p.m.) We practice holistic farming and natural winemaking to allow our wines to express where the terroir. As you sip our wines, you will sense the farm we care for, the passion we have and the memories we share with you. Fee: $10. May 24–25 (11 a.m. to 4 p.m.) J Wrigley will offer a special treat and pour the Diversity Pinot Noir, a Provincial Vineyards wine made by John Wrigley. Food pairings will be offered. Fee: $10. May 23 (11 a.m. to 4 p.m.) Join us for a Memorial Weekend wine tasting. Come see the winery, where John Wrigley will host barrel tasting, and we will welcome you at our humble off-site winery space. Food pairings will be offered. Fee: $10. May 23–25 (11 a.m. to 4 p.m.) Come and taste our newly released 2013 Chardonnay. We’ll also be pouring our estate-grown Pinot Noirs. Plus, check out the progress on our tasting room. Fee: $15 (includes glass). May 23–24 (11 a.m. to 5 p.m.) Join us for a weekend of festivities in the rolling hills of the Yamhill-Carlton AVA. Get to know our team and share our passion for Pinot, food and rock ’n’ roll. Fee: $20. May 23–25 (noon to 5 p.m.) A tasting of single-clone Pinot Noirs and the release of our best barrel blend, 2012 Cinq Eluis Pinot Noir. We will also taste wines from our friends at Owen Roe. Artisan bread, domestic and European cheeses on hand as well. Fee: $20 (with glass); $15. May 23–25 (noon to 4 p.m.) Sample our latest single-vineyard Pinots, Chardonnay, Pinot Gris, Melon de Bourgogne and the release of our latest project, Art Brut, a méthode Champenoise Melon de Bourgogne. “Soil yourself” with wine, incredible views and more — and by more, we mean Pac-Man, Dig Dug, Galaga… Our free-play retro video game cocktail table is a real hit with the kids, big and small. Fee: $15 (includes bites made by Mom with love). May 23–25 (11 a.m. to 4 p.m.) Come experience great views, the Japanese garden and the art collection. We will be pouring a special tasting menu paired with small bites. Saffron Fields, an experience like no other. Fee: $20. May 23–24 (11 a.m. to 5 p.m.) We raise our glasses to the veterans and soldiers who have helped make this country what it is today. Join us at our lakeside tasting room where we will be featuring our current releases, live music and food. Fee: $20 (includes glass). May 23–24 (11 a.m. to 5 p.m.); May 25 (noon to 4 p.m.) Savor full-flavored Stag Hollow 2012 Pinot Noirs and estate-grown Dolcetto. Taste our latest Pinot Noir futures offering and enjoy our winery exclusive Field Blend red, as well as a rare aged Pinot Noir from our library. Friendly personalized tasting. Fee: $10. May 23–24 (10 a.m. to 4 p.m.) Reds, whites and blues. Sip delicious Pinots and taste one of Portland’s Top 10 New Food Carts of 2014, PDX Sliders. Kick back on the patio with live blues music and welcome summer – rain or shine. Fee: $20.